If you aren’t one of the 5 million people who’ve watched a 9-second video of a bizarre purple worm vomit a milky living tree all over a random man’s hand (perhaps in Thailand, judging from the YouTube titles), you should be. Watch it now. Now that you're up to speed, you’re probably wondering what’s going on here. To learn more, mental_floss spoke to biologist Sebastian Kvist, associate curator of invertebrates at the Royal Ontario Museum, where he specializes in Nemertea, the phylum of ribbon worms this creature belongs to. The upshot: This animal is weird, rare, and mysterious—even to scientists. The invertebrate is likely from the genus Gorgonorhyncus, which lives in shallow marine waters. That milky goo is actually the worm’s hunting gear: a very rare branching proboscis that this aggressive predator shoots out from a specialized port to net prey, including mollusks, snails, and even other sea worms. It then drags the captured prey into its mouth and swallows it whole. The worm also throws out its proboscis as a defensive strategy—and that’s what we’re seeing in the video, Kvist says. The worm tries to defend itself by casting out the proboscis, which splatters against the man’s hand. And then the worm starts convulsing. That’s not good. “What we’re seeing is a very stressed worm that’s doing everything it can to try to get away from the situation that it’s in,” Kvist says. It’s no wonder the worm dislikes the open air. With a soft body only a few millimeters wide, it has a hydrostatic skeleton, which means it relies on the ocean’s water pressure to keep its body in one piece. If you pick up a ribbon worm, its fragile body often simply falls apart. Amazingly, that doesn’t generally kill it. “We’re not sure if it’s able to regenerate or not, but it doesn’t seem to be fatal to the worm to break like that—which is really interesting,” Kvist says. Since the worm in the video seems to be in one piece, it’s possible that if it was returned to the water within 10 minutes—about as long as the ribbon worms Kvist has collected seem to tolerate being out of the water—it could have survived its trip to dry land. How Old Are They? Good Question. 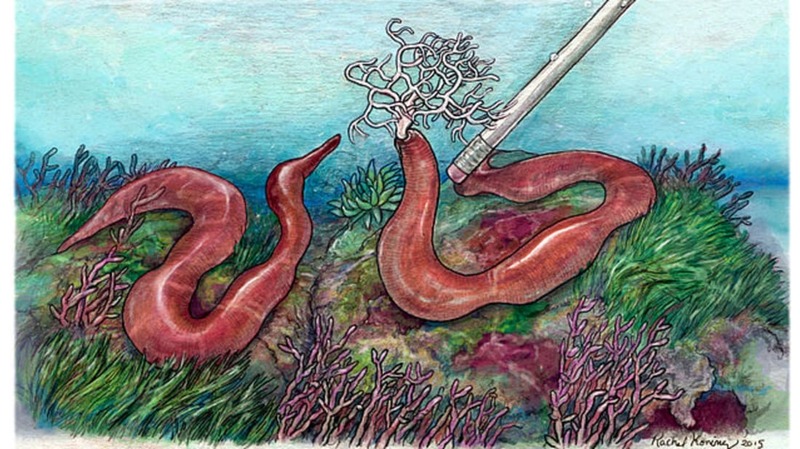 What scientists don’t know about Gorgonorhyncus, and ribbon worms in general, turns out to be quite a lot. There are only a handful of species with a branched proboscis, and they don’t seem to be closely related. That suggests this rare anatomical trait arose independently several times. These few Gorgonorhynchus species live in Bermuda, and a cousin genus, Dendrorhynchus, has been spotted in China. None have been found in Thailand. They’re also scarce. Even in Bermuda, where the marine environment has been extensively researched by scientists, these worms have only been discovered a handful of times. We have no idea how old ribbon worms are either. Being soft bodied and boneless, ribbon worms leave virtually no trace in the fossil record. “That becomes a very problematic thing for trying to establish how recent or how ancient these guys are,” Kvist admits. Kvist hopes his own research will help solve some of the mysteries surrounding ribbon worms. One focus is the phylogenetic affinities, or genetic relationships, among the 500 or so Heteronemertea ribbon worms, which have proboscis ports that are separate from their mouths—just like our viral video star Gorgonorhynchus does. Kvist is trying to figure out whether they share a common ancestor.